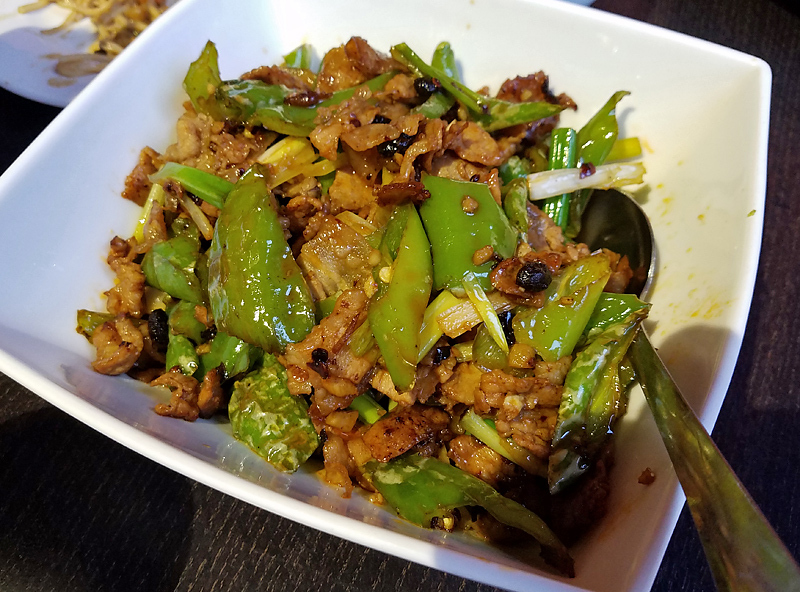 While it was mentioned in the openings thread, I didn't see a separate thread for Sizzling Pot King, a newish Chinese spot in the West Loop, about a block from the new H Mart. I made it there as a solo diner for lunch on Saturday and have been enjoying leftovers since, so I though a post was in order. SPK is clearly focused on dry hot pot, which represents more than half of the menu. 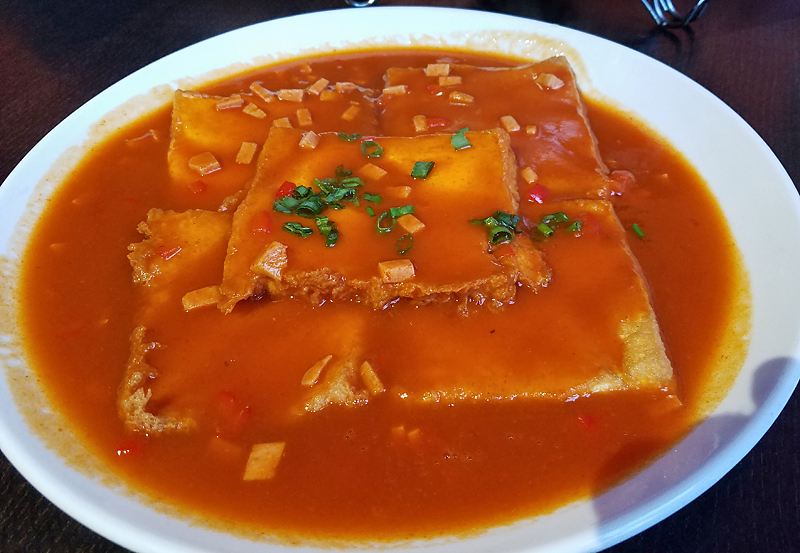 I believe all of the 4-5 other tables (all speaking Chinese) ordered this way, but I really wanted Hunan food, as it is something I've missed since moving to Chicago. Being alone was a serious disadvantage as I really wanted to try the whole menu, but I limited myself two of the many interesting dishes. Wuhan noodles were good, if not earth shattering. They were served warm with a sesame sauce that wouldn't be out of place in a good Chinese-American spot. What set is apart were pickled vegetables - crunchy carrots and diced green or long beans, mainly. Nothing against the noodles, but it was the steamed pork belly with preserved vegetables that stole the show and prompted a post. 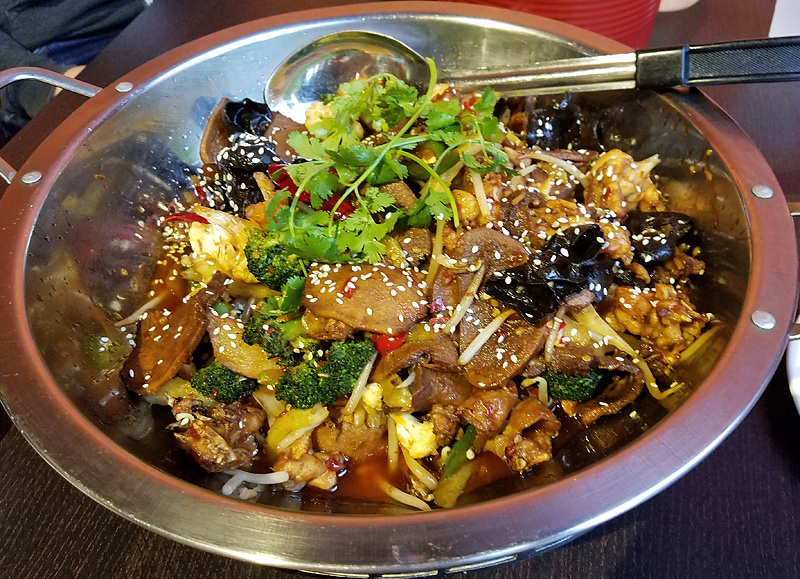 This dish is pure Hunan heaven. A large portion of soy-lacquered pork belly slices were fanned across a mound of preserved vegetables - dried mustard greens, I'm pretty sure. The pork was tender (although it could have steamed a bit longer - I don't think they expected me to order it and were concerned about a wait, so they may have rushed it just a bit) and the vegetable, studded with chili and ginger, soaked up some of the pork fat. It is salty, sour and a little hot, with a great variety of texture in the vegetables, from silky leaves to firm, almost crunchy stems. It was great and even better reheated the last couple of days for lunch. Given the location and relatively sparse crowd, as well as comments in some of the recent reviews, I think this is the kind of place that is going to need LTH support to supplement the Chinese expat community to make a go of it. It's delicious and convenient to H Mart, so I plan to go back soon. I recommend you try it as well. Thanks for starting the thread. It's been on my get-to list since Sula's review in the Reader. I was there about a month ago and really enjoyed our meal . . . These were just fine. Served at room temperature, they kind of reminded me of a sesame noodle salad that one might find at a pot luck -- homey and comforting. I loved this dish and I've been thinking about it a lot since our dinner, especially since I've never really had anything quite like it. Massive and packed with an array of intensely flavored items, it was the clear winning dish at our dinner. We opted for tongue and bullfrog (and were told after we ordered that it was their most popular combination). We also added on black fungus. Broccoli, potatoes, cauliflower, bean sprots and celery were also included. We chose very spicy, which is the 4th hottest level of spice (out of 5) and Mala, which is described on the menu as "numb and spicy." I'd love to have at this one again but maybe swap out the difficult-to-eat frog (so many little bones) for short ribs or lamb ribs next time around. More than meets the eye. The tofu almost ate like a nicely cooked omelet, with a lightly crispy exterior and creamy interior. The sauce was tangy and flavorful but neither spicy nor overly sweet. A great dish. Intense flavors and delicious all the way around. 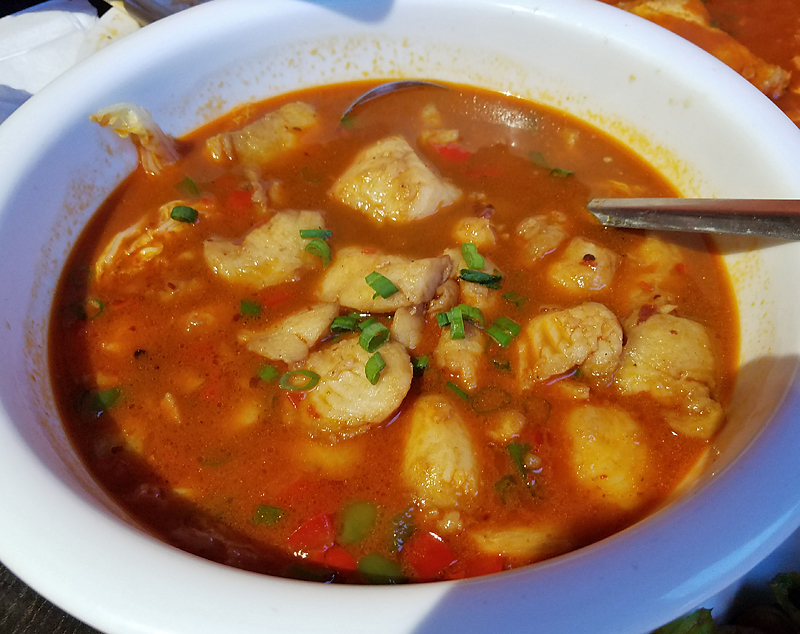 Tender, velveted fish (guessing tilapia) in a mildly spicy sauce. I really don't know this cuisine very well at all but I greatly enjoyed the meal, especially the hot pot, the pork and the tofu. I look forward to a return visit, perhaps with a group large enough to sample a lot more of the menu. We dined here a few weeks ago after Sula's review. They didn't have frog (so sad), so we got the mala hot pot with beef tongue and added chinese sausage, lotus root and vermicelli. It was incredibly delicious, though I think they could have cut the lotus root thinner and tamed the sichuan peppercorns a bit. We also tried the dry noodles, which is an apt name. They required a lot of doctoring with some vinegar and the restaurant's homemade chili paste before satisfying. I look forward to hearing about the other pot flavors and want to go back and try some entree like the magic tofu. I think next time we go garlic frog. My wife and I ate there this past weekend. After Mike Sula's review I was quite ready to enjoy dry pot Hunan cuisine.... We were warmly greeted, and seated in a fairly full restaurant. However we noticed that it was not as clean as we would like....sticky floor, used dishes in tubs scattered in several places, water was served with a lemon slice, but tasted odd....but on to the food: We ordered Wuhan Noodles, as a previous post suggested, it was good, but not better than other restaurants, though some unusual crunchy vegetables (mostly green bean) enlivened it from being totally ordinary. A cucumber side was quite good with flecks of red chili, and served as a mouth refresher for the Spicy Shrimp Dry Pot. About that dry pot....it was quite over-salted, the shrimp were on the smaller side and served head and shell on, not a problem, just messy when covered with sauce. 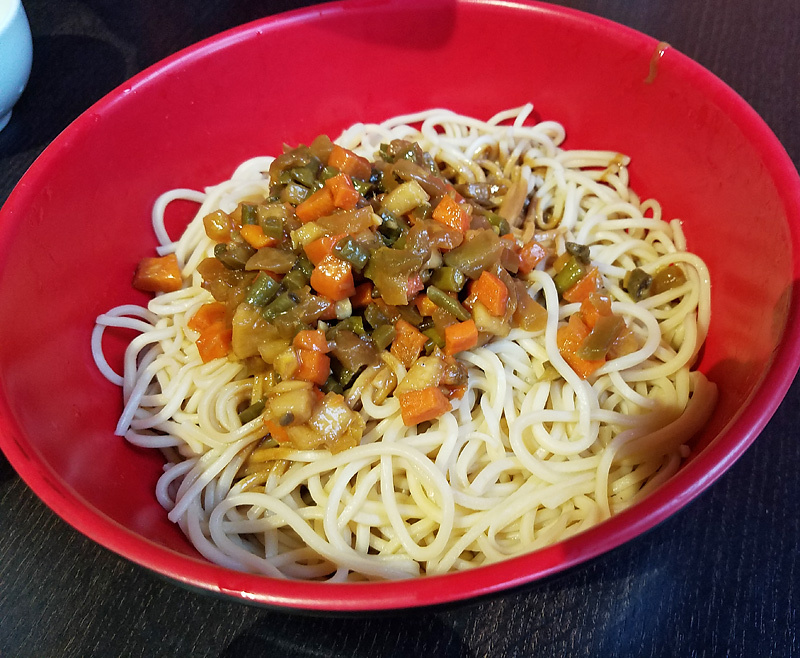 The sauce itself was nothing special, almost veering towards typical brown sauce, but being saved by the peppers, both red and jalapeno. On the whole not the most satisfying meal, and not as wonderful as we had hoped for. I went last week and had a wonderful experience. Got the vegetarian ma la hot pot which tingled delightfully; one of the most wonderfully ma la foods I've ever had. My companion, though culinarily adventurous, had not experienced ma la before and seemed to enjoy it thoroughly. (We went to A Place by Damao a few days later.) Will certainly be back, perhaps to try a non-vegetarian version. Had another fantastic meal at SPK; lunch here earlier today . . .
We opted for Spicy/Hot flavor, medium-level spicy (3 on a 1-4) and while it wasn't quite as ma la as the last couple of times, it was still very spicy, with great flavor. Not too numbing, though. Everything in the pot was so effing delicious, I couldn't stop eating it. 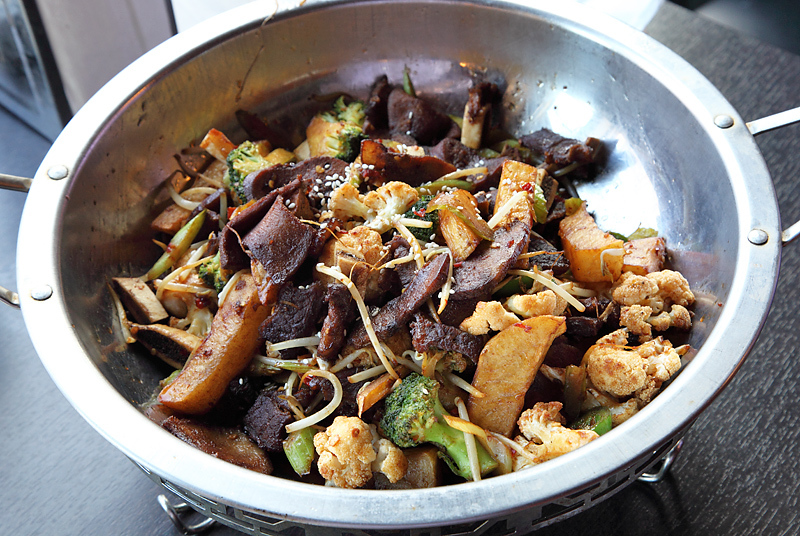 Broccoli, Cauliflower, Potatoes, Celery and Soy Bean Sprout are included by default, though broccoli is not listed as such on the menu. I was under the mistaken impression that they were only open for lunch on weekends but they are (now?) open for lunch every day of the week, which is very nice.